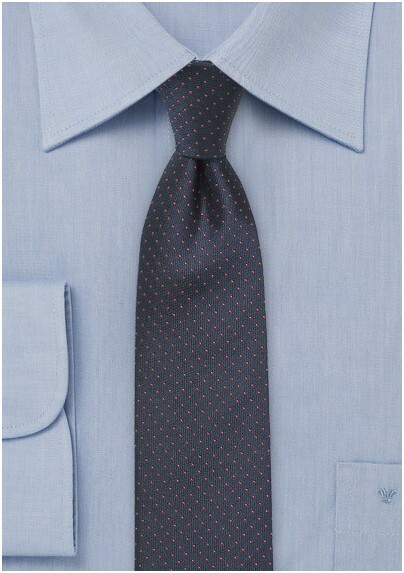 A fun skinny tie featuring a unique color combination of dark navy and coral red. The narrow cut of 2.6" gives this collection a young and hip feel. 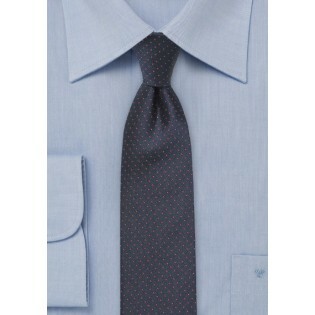 It is perfect for all your European cut sports coats, suits, or simply with V-neck sweater or cardigan. Like this pin dot pattern? Then we also offer it in 7 other colors: Yellow & navy, silver & black, hunter green & yellow, light blue & navy, grape purple & light blue, as well as midnight blue & silver. All handmade from 100% silk. Length: 58", Skinny Width: 2.6"